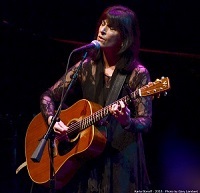 Karla Bonoff has been described as one of the finest singer/songwriters of her generation. With a career spanning four decades, Bonoff has enjoyed critical acclaim, commercial success, enduring popularity and the unwavering respect of her peers. In addition to achieving chart success with her own recordings, Karla has seen her songs become hits for such stellar artists as Bonnie Raitt, Wynonna Judd and Linda Ronstadt. Many of Bonoff's ballads are now pop classics. All the while, she has continued to tour extensively, playing sold-out shows around the world. Karla performs with Nina Gerber on guitar. Advance Reserved Seating Tickets: $44 1st Section; $39 2nd Section; $34 3rd Section; $29 4th Section + applicable fees. Lincoln Theatre Members receive $2 off.